Andrew started as an intern for mongabay.com in October 2013. 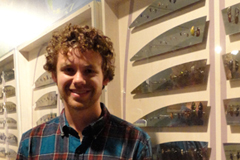 He is a recent graduate of the School of Forestry at Northern Arizona University. He is currently living with his girlfriend and their dog, Champ, in the Denver, CO area. After spending many summers on his grandparents’tree farm in West Virginia, he formed a great love for the land –especially forests. Conservation work and research have presented many opportunities for travel. Throughout work done in field stations in Costa Rica, Peru and Nicaragua, Andrew spent nearly a quarter of his college career in the tropical forests of Latin America. He would like to pursue a career as a researcher in forest entomology. In his free time, Andrew enjoys nature photography, listening to music and playing pick-up soccer.